Tspsc Prohibition & Excise Constables Results (Final Selection list Results): Tspsc Prohibition & Excise Constables recruitment results for Certificates verification dates/schedule 2017, Provisionally admitted candidates list: The TSPSC Published the list of Registered numbers of Provisionally admitted candidates and dates for verification of certificates for the above post on the basis of written examination held on 31-07-2016 which is placed in TSPSC website. The verification of certificates will be held in the Office of TSPSC at Prathibha Bhavan, Nampally, Hyderabad from 29-12-2016 to 05-1-2017 from 9.00 am onwards. Telangana State Public Service Commission, Hyderabad, Prohibition & Excise Constable in Prohibition & Excise department notification no. 06/2016 General recruitment), Result notification for verification of certificates: It is hereby notified that on the basis of the Written Examination held on 31/07/2016 to the posts of Prohibition & Excise Constable in Prohibition & Excise Department the candidates with the following Register Numbers have been provisionally admitted for the verification of Certificates. Tspsc Prohibition & Excise Constables Results (Final Selection list Results): In continuation of result notification on 16/04/2018, it is hereby notified on the basis of the results of the written examination held on 31/07/2016 and Verification of Certificates, Events (PQT & PET) conducted and Medical Test to the post of Prohibition and Excise Constables in Excise Department. The selection for certain categories in Rangareddy & Hyderabad are declared herewith, out of 24 vacancies 22 vacancies were filled and 02 vacancies are left unfilled due to nonavailability of eligible candidates in certain categories. The following Hall ticket numbers have been provisionally selected for appointment to the post of PROHIBITION AND EXCISE CONSTABLES IN EXCISE DEPARTMENT vide Commission’s Notification No.06/2016 subject to the following conditions. 1) That success in the Examination confers no right to appointment unless the appointing authority is satisfied after such enquiry as the case may be considered necessary that the candidate having regard to her/his character and antecedents is suitable in all respects for appointment to the service. ఎక్సైజ్‌ కానిస్టేబుల్‌ పోస్టుల తుది ఎంపిక పూర్తయింది. మిగిలిన 24 పోస్టులకు అర్హత పరీక్షలు నిర్వహించగా 22 మంది ఎంపికయ్యారని టీఎస్‌పీఎస్సీ వెల్లడించింది. మొత్తం 24 పోస్టులకు హైదరాబాద్‌ నుంచి 17 మంది, రంగారెడ్డి నుంచి 5గురు అర్హత సాధించారు. సరైన అర్హతలు కలిగిన అభ్యర్థులు అందుబాటులో లేకపోవడంతో రెండు పోస్టులు ఖాళీగా ఉన్నాయి. In Continuation of result notification for verification of certificates dated: 29/12/2016,14/02/2016,13/10/2017,14/10/2017 & 16/10/2017, 17/10/2017 and 28/03/2018 It is hereby informed that on the basis of the Written Examination held on 31/07/2016, Physical test and Medical test to the post of Prohibition & Excise Constable in Prohibition & Excise Department with the following Register Numbers have been provisionally admitted for the verification of Certificates. The candidate who are admitted for the verification of Certificates are required to produce the Original Certificates along with one set of Photostat copies duly attested by Gazetted Officer, relating to Age, Qualifications Community (Integrated) , Latest Creamy Layer exemption certificate in case of B.Cs as per Memo No.3009/BCW/OP/2009, Government of Telangana, Backward Classes Welfare (OP) Department, Dt:18/12/2015 (prescribed format hosted on Commission’s website), Certificates relating to claim of age relaxation, Study (from 4th class to 10th class), basic information data (Check List(1set), attestation forms (2 sets) and if any, at the time of verification of documents, failing which, they will not be admitted in subsequent process of selection. No request will be entertained for subsequent submission of any of the above certificates. In terms of the notification, the candidates should possess the requisite qualifications as on date of notification i.e., 30/04/2016. The verification of certificates will be held in the office of TSPSC at Prathibha Bhavan, Nampally, Hyderabad on 20/09/2018.at 10.00 A.M Onwards. The candidates are requested to obtain and keep ready all the certificates as mentioned in the Notification. The candidates who are qualified in PET Test to the post of Prohibition & Excise Constable vide Notification No.06/2016 are directed to attend Physical Test on 28th August 2018 by 09:00 AM Sharp at Osmania General Hospital, Afzalgunj, Room No. 507, MRD and 29th & 30th August 2018 by 09:00 AM Sharp at Sarojini Devi Eye Hospital, Administrative Block, Mehdipatnam. The candidates are instructed to bring their Hall Ticket, two latest pass port size photos, any ID proof and pay Rs. 300/- towards the Medical Board fee to the Hospital Authorities. For detailed schedule visit Commission’s website (www.tspsc.gov.in). Himayath Sagar Road, Bandlaguda Hyderabad at 5.00 AM sharp, after events certificate verification will be conducted. For the list of candidates and further details candidates may visit Commission’s website i.e., www.tspsc.gov.in. The Candidates whose Registered Nos. are given below are provisionally admitted for PET. The candidates are directed to attended for PET Test on 08/08/2018 at Excise Academy , near Are Maisamma Temple (khali mandir) Himayath Sagar road, Bandlaguda, Hyderabad at 5.00 A.M Sharp. Landmarks: Langer House to Chevella Road, (2km Are Maisamma Road (Left Turn), Beside Don Bosco Post Office. Further it is informed that the candidates must produce Hall Tickets along with Original Aadhar Card, and PQT Conformation Stamp which is given on the day of PQT and any other valid identification card (voter ID or Driving License etc). The Candidates are further informed that request for Postponement of PET will not to be entertained. It is hereby informed that the candidates are instructed to attend PQT Events which will be held on 18/07/2018 at 05:00 AM Sharp at Shamirpet ORR Junction to Muneerabad ORR Service Road (at celebrity club main gate). After Events Certificate Verification will be conducted. For the list of candidates and further details candidates may visit Commission’s website i.e., WWW.tspsc.gov.in . The selection notification for 310 posts was announced on 16.04.2018 duly mentioning that 24 vacancies will be filled later. The 24 posts in various categories in Hyderabad and Ranga Reddy districts were not announced as they were partially filled, out of which candidates for 12 vacancies are available. Many of the candidates were eliminated in different stages. Hence now the Commission has pickedup 463 candidates against 12 posts for further selection process to prevent further phases of certificate verification. at the time of verification of documents, failing which, they will not be admitted in subsequentprocess of selection. In terms of the notification, the candidates should possess the requisite qualifications as on date of notification i.e., 30/04/2016. The PQT Events will be held on 18/07/2018 after completion of PQT & PET Events and Medical Tests, the Certificate Verification will be conducted. 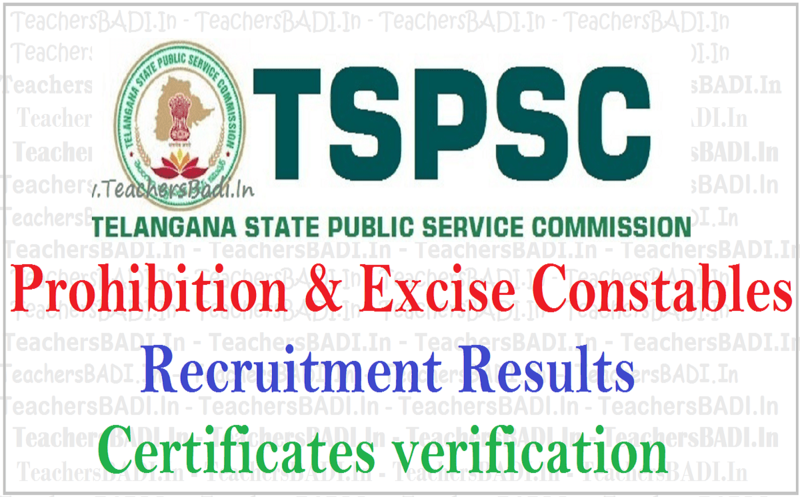 Tspsc Prohibition & Excise Constables Results, Certificates verification dates 2018: Results for Notification no. 06/2016 Prohibition & Excise Constable in Prohibition & Excise Department. In Continuation of result notification for verification of certificates dated: 29.12.2016,and 14.02.2017,It is hereby informed that on the basis of the Written Examination held on 31/07/2016 to the posts of Prohibition & Excise Constable in Prohibition & Excise Department with the following Register Numbers have been provisionally admitted for the verification ofCertificates. 2. The candidate who are admitted for the verification of Certificates are required to produce the Original Certificates along with one set of Photostat copies duly attested byGazetted Officer, relating to Age, Qualifications Community (Integrated) , Latest Creamy Layer exemption certificate in case of B.Cs as per Memo No.3009/BCW/OP/2009, Government of Telangana, Backward Classes Welfare (OP) Department, Dt:18/12/2015 (prescribed format hosted on Commission’s website), Certificates relating to claim of age relaxation, Study (from 4th class to 10th class), basic information data (Check List(1set), attestation forms (2 sets) and if any, at the time of verification of documents, failing which, they will not be admitted in subsequent process of selection. No request will be entertained to subsequent submission of any of the above certificates. In terms of the notification, the candidates should possess the requisite qualifications as on date of notification i.e., 30/04/2016. 3 The verification of certificates will be held from 27/01/2018 to 02 /02/2018 at Government Polytechnic College (Sankethika Vidhya Bhavan) MasabtanK, Hyderabad.The candidates are requested to obtain and keep ready all the certificates as mentioned in the Notification. 5. The day wise schedule will be available by 20th January 2018 on TSPSC website. the certificates as mentioned in the Notification. For schedule for verification of certificates and further details Candidate may visit Commission’s website. TSPSC Prohibition & Excise Constable (06/2016) - Physical test schedule: The candidates who are qualified in PET Test to the post of Prohibition & Excise Constable vide Notification No.06/2016 are directed to attend Physical Test on 23rd and 27th to 29th December 2017 by 09:00 AM Sharp at Osmania General Hospital, Afzalgunj, Room No. 507, MRD. The candidates are instructed to bring their Hall Ticket, two latest pass port size photos, any ID proof and pay Rs. 300/- towards the Medical Board fee to the Hospital Authorities. For detailed schedule is available on Commission’s website (www.tspsc.gov.in). The candidates who are qualified in PET Test to the post of Prohibition & Excise Constable vide Notification No.06/2016 are directed to attend Vision Test from 12th to 15th (MEN) and 16th (WOMEN) December 2017 by 09:00 AM Sharp at Sarojini Devi Eye Hospital, Administrative Block, Mehdipatnam. The candidates are instructed to bring their Hall Ticket, two latest pass port size photos, any ID proof and pay Rs. 300/- towards the Medical Board fee to the Hospital Authorities. For detailed schedule is available on Commission’s website (www.tspsc.gov.in). b) PET test for 2 days 05-12-2017 and 06-12-2017at Excise Academy, Bandlaguda at 05:00 A.M Sharp along with Hall Ticket detailed web note is available on Commissions website (www.tspsc.gov.in). TSPSC has informed that the candidates whose Registered Nos are given below are provisionally admitted for PET. The candidates are directed to attend for PET at Excise Academy for Telangana State, Near Kali Mandir, Bandlaguda, Hyderabad at 05:00AM sharp. Landmarks Langer House to Chevella Road, (2 KM Ara Maisamma Raod (LEFT TURN), Beside Don Bosco Post Office. Further it is informed that the candidates must produce Hall Ticket along with Original Aadhar Card or any other Original valid Identification card (Voter ID or Driving License) for verification of Candidate. The candidates are further informed that request for postponement of PET will not be entertained. It is hereby informed that the verification of certificates for Prohibition & Excise Constables schedule from 10-10-2017 to 13-10-2017 is postponed to 13-10-2017, 14-10-2017, 16-10-2017 and 17-10-2017. The verification of certificates will be held at Govt Polytechnic College (Sankethika Bhavan), Masab Tank, Hyderabad. For the schedule of the verification of certificates and further details canidates can visit the Commission's Website. The candidates are requested to obtain and keep ready all the certificates as mentioned in the Notification. comply with the above directions may lead to cancellation of his / her candidature. Sub:- TSPSC – Recruitment (Direct) to the post of Prohibition & Excise Constable in Excise Department Vide Notification No.06/2016-Verification of Certificates – Regarding. Ref:- 1) Commission’s Notification No. 06/2016, Dated : 30/04/2016. and two sets of attestation forms for verification of certificates without fail. 03 Integrated Community Certificate (issued by the concerned M.R.O./ R.D.O). Two latest Passport Size photographs. 10 Attestation Forms in duplicate (2 copies) duly filled in by the candidate and duly attested by any Gazetted Officer. (Download from the Commission’s website). All Certificates Shall be produced at the time of verification and no additional time will be granted.